FISHERS, Ind. 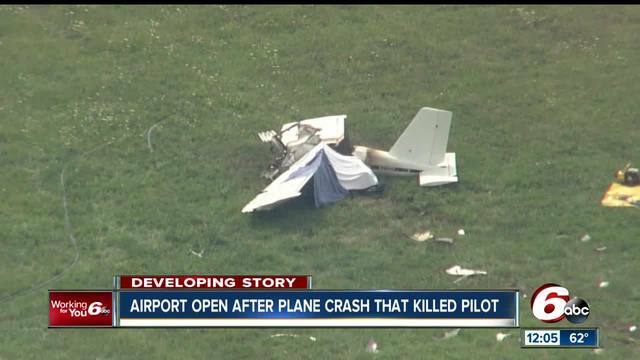 -- A 78-year-old man died Thursday morning in a plane crash in Fishers, Indiana. The crash happened at the Metro North Airport in Fishers around 11:30 a.m.
Fishers Police Department spokesperson Tom Weger said the pilot was the only occupant. He was pronounced dead at the scene. The man was later identified as Norman Lavine, 78, of Carmel, Indiana. A single-engine plane crashed during its takeoff, according to the FAA. Initial sources said the plane was landing at the time of the crash. Investigators said a helicopter starting to land noticed the plane and attempted to get the pilot's attention as there was only one runway. The crash is now under investigation by the FAA and the NTSB. Mike Young, who lives near the airport in Fishers, said he heard his dog barking and looked up. "There was rolling black smoke just beyond the treeline," Young said. "There are no businesses over here. It was rolling pretty good. Which to me indicated a problem here." Young said small planes frequently come in and out of the airport and about 24,000 flights land and depart. Preliminary reports from the NTSB said the aircraft came to rest approximately 100 feet from the initial impact location and then caught fire. An avionics component of the aircraft's engine has been sent to the lab for further evaluation. A preliminary accident report will be completed within the next week but the final report could take upwards of a year.